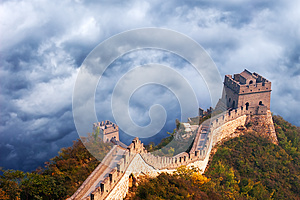 Dramatic scene of the Great Wall of China near Beijing. A stormy sky and clouds create a dramatic and scenic backdrop or background. The wall is a popular travel destination and tourist attraction for tourists on vacation or holiday when going to the orient or far east.